In service, electrical equipment that have cellulosic / dielectric fluid systems can be grossly contaminated with moisture. Power Transformers in particular with their oil / paper insulation systems are susceptible to such contamination, take for example a typical large transformer that has not been specifically protected to prevent ingress of moisture: A 75 MVA transformer having 45,460L oil and 4000 Kgs paper. After twenty years in service this transformer may have up to 4% by weight of water in its solid insulation. This transformer would then possibly have 162 litres of water stored in its dielectric system. The bulk of the water some 160 litres or so will then have been absorbed by the cellulosic insulation and only perhaps two litres in the oil. A transformer so contaminated would be seriously weakened both electrically and mechanically and unless steps are taken to remove the water it is quite feasible for such a transformer to be involved in a dramatic breakdown and be lost. The contamination process involves water absorbed from the ambient air and water generated internally by oxidation of the dielectric materials used in its construction, it is generally a slow process taking up to twenty years. Over this period the water will have been absorbed deep within the layers of paper and pressboard and as a consequence it is not readily removed. 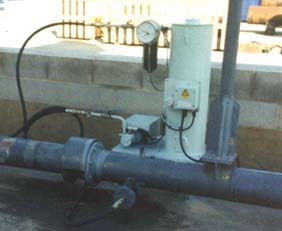 Portable Heat / Vacuum Dryers are most useful when applied for a week or so to polish the oil in well maintained and protected transformers, they will do little to restore dryness of the described example, it will, unless applied for some months remove only the relatively small quantity of water from the oil and surface of the outer layers of the paper insulation. The Heat / Vacuum Dryer also requires the transformer to be taken out of service, which in the case of a Generator Transformer or other strategically important unit would involve revenue losses of tens of thousands of pounds sterling per day. The best drying system is one which can be operated with the transformer in service and be left unattended for long periods of time until the transformer is restored to an acceptable level of dryness. Molecular Sieves are now available to perform this task.